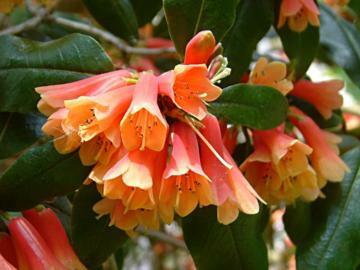 Somewhat variable evergreen, usually a loosely branched, medium to large shrub but sometimes found with a much dwarfer habit. 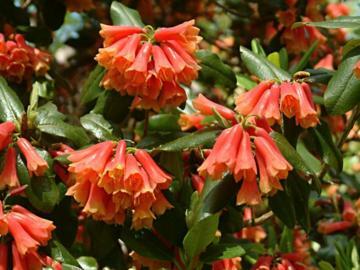 Trusses of slightly pendent, narrowly tubular, deep red to salmon pink flowers often with orange or yellow lobes giving a bicoloured effect. Leathery, scaly, dark green leaves up to about 15cm long. Unusual and very attractive when in flower in late spring. From seed, but germination can be erratic. Cinnabarina group Rhododendron. From Southeastern Tibet, Bhutan and Assam.